It seems a bit early to think about Christmas cookies, but I saw this at my local grocery store on Friday. I always purchase the Land O'Lakes cookie booklet each year and any other that catches my eye. Last year I began to think maybe I shouldn't purchase any more of these publications. Surely by now I have just about every cookie recipe on earth. But this one I had to purchase. The layout of the magazine was well designed. The cookie recipes are organized according to shapes and types. The use of fonts, color and the photography was very appealing. Even the feel of the paper is nice. The cookies look yummy and their instructions are clear and some are illustrated with extra "how to" photos. The magazine is available now. I'm thinking about making some of these for Thanksgiving. Love the melted snowmen cookies shown above. I know I promised a contest the last time I blogged and didn't follow through. So, finally....here it is. Leave a comment and I will name the winners on Thursday. Cookies and fabric - two of my favorite things! Don't those cookies look yummy? And doesn't that FABRIC look yummy? Thanks for reminding us that Christmas is coming! I love these fabrics!! And I love cookies - my favorite saying is 'When things are bad and getting worse, keep a cookie in your purse'. Isn't that the best saying and aren't your fabric designs the best also!! Yum! Cinnamon spice! Please put my name in the hat! I haven't seen this issue yet. I was just thinking today that It's getting time to start baking again. Of course, your gorgeous fabric also makes me want to get to my sewing machine. Love it! HI!!! The cookies look wonderful and yummy and so do the fabrics!!!! Thank You!!! I'm laughing, because despite the number of cookie cookbooks I own, I have a hard time passing up one (especially one with yummy pictures)! Cookies are my favorite sweet treat, hands down. Yummy - both the cookies and the fabric! I don't bake much except at holiday time and I never seem to use the same cookie recipe twice b/c there are so many out there to try. I love cookies that have "cinnamon and spice" in them. What a perfect pair!!! I bought one of those cookie magazines a few years ago and found some absolutely fabulous recipes that I still make. Love Christmas baking! And absolutely love those fabrics! Love that fabric it's yummy as are the cookies! Thanks for the chance. Yum! I never met a cookie that I didn't EAT :) Thanks for the chance to win these sweet treats! Oooohhh please put me in the drawing, what yummy fabrics! Thx for offering this thoughtful and yummylicious treat, I'll toss in a chance, thx! Such lovely fabrics - always classic. Who doesn't love cookies? The melted snowmen cookies are a riot. Thanks for the chance. The fabric looks fantastic! I certainly would love to win! I've had my eye on Cinnamon Stars and, of course, it goes perfectly with cookies! I love fabric and cookies! Thanks for the giveaway! Now I want to go bake Christmas cookies. Before I read your post I was going to slip out of work early to do some applique. Does this mean I will have greasy fingerprints on my applique? The fabric looks DELICIOUS...and NO CALORIES involved! Please enter my name in the drawing. I love those fabrics!! I just love those warm tones. Cookies! Cookies! I love them. We always make a bunch of cookies for the holidays and each year we try to add at least one new cookie. I would love a chance to win. Cookie magazine looks like a "must have"!! How appropriate that your fabric conveys the right cookie message... Cinnamon Spice! I buy new cookie magazines every holiday season too. And, as usual, love the new fabric line. Thanks for another yummy batch of fabric, girls! Please put my name in the mixing bowl. Fabric and cookies! A fantastic and generous giveaway. I'd love a chance. Thank you! Oh those cookies sound so good right now!! I love the look of your new fabric line it amazes me how you two are always coming up with new stuff, keep up those ideas. I would love a chance to win some of Cinnamon Spice. Thanks for sharing!!! Now off to see about cookies. Love the fabric! And I usually buy a new Christmas cookie magazine each year also. Funny thing is there usually is only one or two new ones in them the rest are so much like the previous years. But I always find something with a new spin on it. The fabric looks gorgeous! Great giveaway! I am hungry now! I would love to win, thanks for your generosity. I would absolutely love to win your giveaway. I made a hexagon quilt with some of your fabrics and can see those fabrics being made in the same way. Gorgeous. also love your blog. What a wonderful combo for a giveaway! Could it get any better?! Oh, I love cookies. But, I think I like your fabric even more. Easier on my girlish figure! The fabric is so pretty. Would love to win. The cookies look yummy, too. What pretty fabric. Thanks for the chance to win some! You always tempt me with all that baking you do! I love your new line and would love to be included in your drawing. Love that fabric and the cookies look yummy too!! So i love both! I love your fabric and I love cookies! Perfect combination. Love all of your designs and cookies as well! I think cookies are just a part of christmas. The fun of making them, giving them as gifts and the smell in the house, all say christmas. Love the name of your new line, perfect for a holiday quilt. Cookies and fabric. I love them both. Please enter me in your drawing. 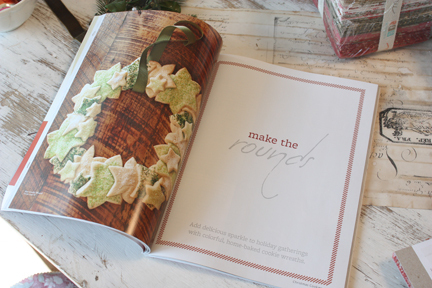 I love the fabric and MY husband would love the BHG cookie magazine, as he L-O-V-E-S to bake. Your fabric looks as yummy as the cookies. Your new fabric line is fabulous! I can't wait to be able to start baking again... cooler temps are coming soon! Thanks for a chance to win Cinnamon Spice. Yum! Wow! Please add me to the drawing! I love those cookie magazine, but find that after several years, they do repeat recipes. Please add me to the drawing. Fabrics are beautiful and do I see some sort of pie/cookie in a picture. Yum! Love the fabric! Please add me to the contest. Oh my, those cookies look so yummy! Always a good time to get a start on looking for cookie recipes. Your Fabric line looks just as yummy! Thanks for sharing and I would LOVE to enter this delicious contest. thank you! I love the colors in this collections. So warm! Thank you for the opportunity to win some! Cinnamon spice looks so pretty. You are one of my favorite fabric and quilt designers. Thank you so much for the chance to win. I can't believe it's time to think about Christmas! essimai 19Your fabrics are always wonderful! 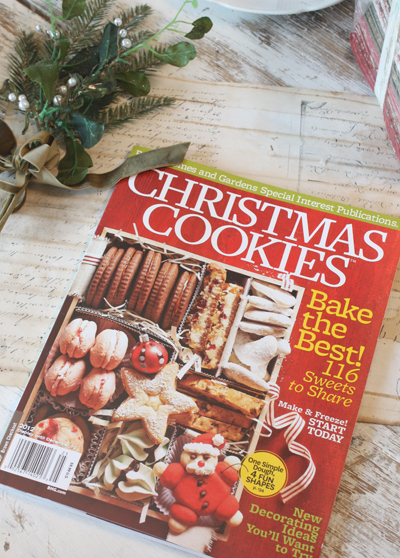 I saw that magazine at the store the other day and couldn't look at Christmas cookies yet - but I am a sucker for those wonderful Better Homes and Gardens special subject books! I hope I win!!! The colors in your new line of fabrics are beautiful. 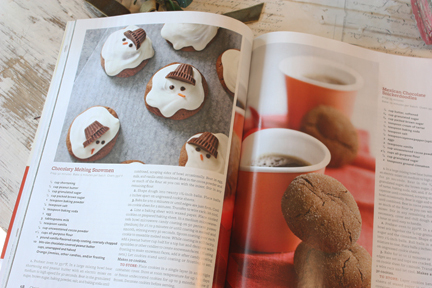 Who wouldn't love some Cinnamon Spice and a cookie magazine? Thanks for the opportunity. It doesn't get better than cookies and beautiful fabric! Please put my name in the drawing. The new fabric is beautiful. I love Christmas time and also look for the cookie mags but I haven't picked this one up yet. So, I will keep my fingers crossed. Thanks! Would love to win a bundle!!! Oh my, a perfect combination! Cookie recipes & Cinnamon Spice fabric. Thanks for a chance to win! I love baking cookies almost as much as I love to quilt. What a wonderful prize combination! Would love to win some fabric and a cookie magazine. What a sweet combination. I love your fabric and homemade cookies and would be most happy to be one of the winners. Oh cookies and fabric. Love sweet things!! The fabric is beautiful! What beautiful fabric! And cookies! Thank you! The hard part would be to either play with the fabric or bake the cookies or eat the cookies while playing with that gorgeous fabric. Thanks again for a wonderful try at your fabs. I hope I'm not too late to enter the draw too. Your photos and fabric are inspirational. And yes, I am buttering you up in the hopes of winning. But it is the truth, really! Oh, how fun! I bake Christmas cookies every year. Please include me in your giveaway. Oh!!!! Cinnamon and spice and fabric that is nice! I always buy a Christmas cookie cookbook every year too! Cinnamon Spice AND cookies! It feels like Christmas will be here soon! Please include me in your drawing. Oh, I have been "eyeballing" your Cinnamon and Spice fabric.....it is so beautiful! Those cookie photos look so good, make me hungry. If I win, I will bake Christmas cookies this year! OOOH!!! I love fabric and cookies! Thanks for the giveaway! No one can resist cookies...especially not Christmas cookies. The new fabric is beautiful! Cookies and Blackbird fabrics just go together. Thanks for the contest. I'd love to use this fabric for a Christmas tree skirt I'm making as a wedding gift. It's beautiful! I always check out the cookie cookbooks at the store. Love the snowman cookies that you've pictured. Thanks for thinking of us. Oh, I do LOVE CoOkIeS! Cinnamon Spice is a super food. So what's not to love about that? Thank you for the fun give away! Oh... please add my name to his one... they look devine... Thank you for these contests. the new range of fabrics look divine. Please enter me in the draw! thank you! Love to win a copy of christmas cookies and if I don't win I hope American Book Store in The Hague sell them too. Of course I would love to win your beautiful fabric but if I don't win, that will be easier to buy in stores in Holland. I would love to win some of that lovely fabric! I have loved your fabric lines for a long time and the Cinnamon Spice looks like another winner! The cookie mag looks like a good one! I buy that magazine every year, as well! I didn't know it was out already. If I don't win, I'll have to look for it. The new fabric looks wonderfully delicious, too! Fabric and cookies - it doesn't get better than that! Thanks for the chance to win!! Well, I, too love cookies; what a coincidence! Your fabric line is yummy, too; really beautiful. Thanks for the chance to daydream about winning some! This fabric line looks wonderful for Fall. I like the cookies, too! cookies and fabric! How wonderful!! !Makes any holiday adelight. Thanks for the heads up on the great cookie magazine. I always like to get these and think about all the great homemade goodies I'll make, and then I run out of time during the holidays. Kinda like quilt projects LOL! Thanks for the chance at some of your wonderful new fabric. I grew up on Cinnamon toast and chocolate milk.... These fabrics are beautiful. There needs to be a Snickerdoodle quilt.. you know those cookies you made with your mom when you were little rolling cookie dough balls in cinnamon and sugar?!?!? I have to say the fabric appeals more than the cookies but really they both look good. Cinnamon Spice and Christmas Cookies! Both such wonderful things! Love Christmas, cookies and your designs! Love the colours in cinnamon and spice! Thanks for the chance to win a great combo. Oh, I love the cookbook but love the fabric even more. I can't quite face the holiday baking yet. Would love to be the owner of the cookies magazine and the material is just beautiful. 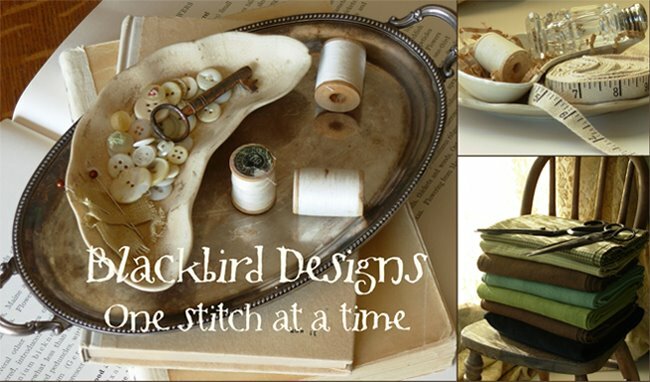 I am such a huge fan of all things Blackbird designs! I am excited about the opportunity to put my name in the draw for your giveaway. I will keep my fingers crossed!!! How incredibly generous! Fabric and cookies? Yay! This fabric looks wonderful! Thanks for the giveaway chance. I love the colors in your new fabric line! Perfect for Thanksgiving as well as Christmas. What a great giveaway. Thanks! Love your fabrics and patterns. Thanks for the great giveaway. The fabric looks awesome and so does the cookie magazine. Thanks for the chance to win! Another great collection from you!! Can hardly wait to see it in person!! Your designs are truly wonderful!! The fabric looks as yummy as the cookies. Oooohhhhh......fun! Please count me in! I love Christmas cookies and your photos make me want to run to the kitchen and start baking. Love the fabrics too! Your new fabric line looks as yummy as the cook book! I love cinnamon so your fabric name is so tempting. The fabrics look fantastic and who doesn't love Christmas cookies?! Please add my name. The fabric looks wonderful! Would be thrilled to get it! I love Christmas quilts and cookies! What could be better? Thanks for the chance to win these. Yummy fabric & cookies! Please count me in! Cookies and fabric, I love both things. I'm glad I'm not the only who collects Christmas cookie magazines! I just can't resist and do you know I really do use one from the early 90's to this day. Your fabric looks yummy, too. Love those melted snowman cookies! Just from the picture, that looks like a much better recipe than the one I made last December. I love this fabric and the rich colors. Christmas will be here soon...oh my! Thanks for the giveaway...two great choices. What a fabulous giveaway. That fabric is very pretty. Thanks. 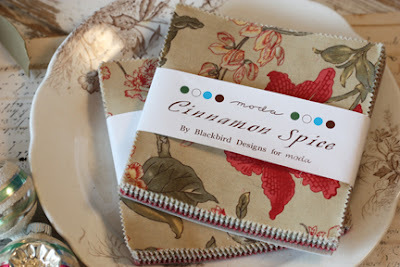 Cinnamon Spice is a great name for your fabric, a lovely non-fattening treat! I would love to win your Cinnamon Spice collection! I love all of your fabrics and books! Alma - I would love to be entered. The colors of this new line of fabric are right up my alley. I love to bake cookies and new recipes would be great. And the Cinnamon Spice fabric looks so beautiful. Oh yes, I would like to win! Love the new fabric!! The cookie magazine looks great! I have a collection of cookie recipe books. Love them all! Looking forward to discovering Cinnamon Spice in the shops! I love the fabrics! They are cute for my Christmas ideas! 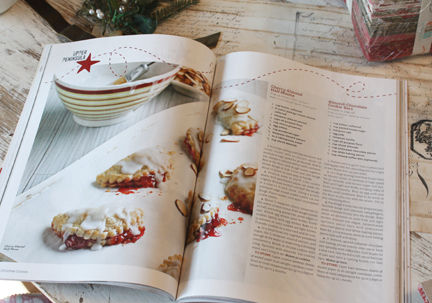 I love holiday baking magazines! A giveaway with cookies and fabric couldn't be better! Thanks! I'm a sucker for cookie magazines too and Christmas craft magazines. I just can't pass them up even though I've never made anything out of them! Just inspiration, I guess. I would love to be entered into your drawing. The fabric looks yummy! Oh how I'd love some of your fabric no one close sells it so I never get to really see and feel it, I do order on line though..........Thanks for the pic of the melted snowman cookies my sweet dog died this week and the snowman put a smile on my heart! Oh my...you are too generous!! Cookies and fabric...Christmas came early to blogland!! Thanks so much for the chance to win! The only thing I like as much as fabric is food...and cookies are the best! Would be thrilled to win! 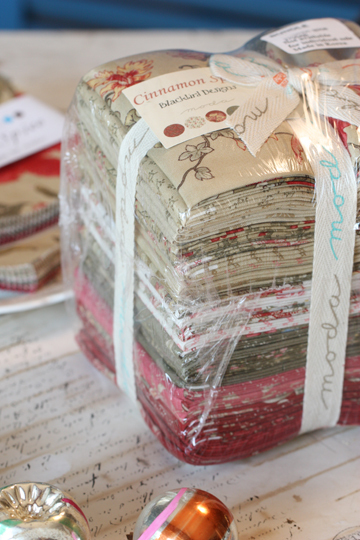 Chance to win some of the new fabric range........Yummiest!!! As I was reading I thought, how perfect- a cinnimon and spice fabric line with the christmas cookie book. Then, I read the very thing I was thinking. I have a great christmas quilt pattern that would be perfect for this if I would win. Thanks for the chance and Happy Holiday baking. What is not to like? Beautiful fabrics and loads of cookie recipes. Great giveaway, please toss my name in. Fabric and cookies...two of my favorite things! Thank you for the opportunity to win! I am a magazine~aholic and love cookie/cooking magazines among others. I always love your fabric lines! Please include me in your very generous giveaway! Wonderful giveaway, your post has put me in a Christmas baking and making mood! So sweet of you. Cinnamon Spice is beautiful! and I love to bake cookies. 428Your new fabric looks gorgeous and I would love to make a Blackbird quilt with it. Cinnamon spice sounds like a cookie! I'll bet the fabric is as lucious as the cookies in the magazine! I have always made Gingerbread men with my children and we hung them on our tree, It's a favorite memory.Your fabrics look gorgeous, as always. Thanks for the chance to win. Looks like a wonderful book of recipes.... and gorgeous fabric. I've had my eye on Cinnamon Spice for a while, so thanks for the generous giveaway. Those cookies look great, but your fabrics are even better! I have to buy those Christmas Cookie books every year too! I would love to win the fabric. Do you bake early and freeze cookies, or just bake like crazy at Christmas? It's hard to believe Christmas is just around the corner! I love the L.O.L.cookbooks~ I haven't gotten this years yet and the fabrics are just wonderful! Please add my name to the pot. I have been trying to decide on an ornament to stitch, so Christmas has been on my mind a lot lately :D.
Thank you for the opportunity to win some of your lovely fabrics and the cookie book. Mmmm Cookies! My grandmother taught me and to this day I still use her recipes. What wonderful memories! And Cinnamon Spice fabric. How wonderful! Cookies and fabric, how fun! Those melted snowmen look like they would make little hands happy. Cinnamon Spice, I''m sure that there must be a cookie by that name, so what a great combo, lovely fabric and. yummy cookies. My gramdmther's name was Alma. Her favorite cookie was a ginger coolie called lebkuchen . I have her recipe but it was horrid when I tried it. She was a seamstress and I probably got my quilting love from her. Cinnamon and Spice! What more says Christmas Cookies? Now we have fabric to match all the yummy cookies and make a holiday quilt! These fabrics are gorgeous! And I love cookie baking, especially with my two-year-old granddaughter. So yummy - the fabric AND the cookies! THanks for the giveaway! Thanks so much for the giveaway! Love the fabrics, will surely make a lovely Christmas quilt! Love cookies and fabric! Thanks for the giveaway! Oh my I love your new fabrics! I love all your fabrics. Please enter me too! I love the cookies magazines too. I'm a sucker for them, but more of a fan for your fabrics and books. Less calories in your offerings too! Of course like everyone, I would love to win. You sold me on the cookie book, then reading further, I might win, plus some fabric, that is win, win! Thank you for sharing your interests, they are usually mine also! Oh my I just love the fabric and like yourself love those baking publications. Thank you for a chance to win! A PERFECT combo...cinnamon, spice and cookie recipes. With all of this it will be A WONDERFUL LIFE. Yummy fabric and yummy cookies! Doesn't get any better than that!! What a great giveaway. Thanks!! !